If you’re running a website — be it a world-famous news portal or a personal blog — there’s a good chance you spend a lot of time poring over your stats. There are of course plenty of services available to help with this, including the hugely popular Google Analytics. But the older systems tend to have lengthy lag times before they’ll generate a report, whereas services like Chartbeat show things as they happen. 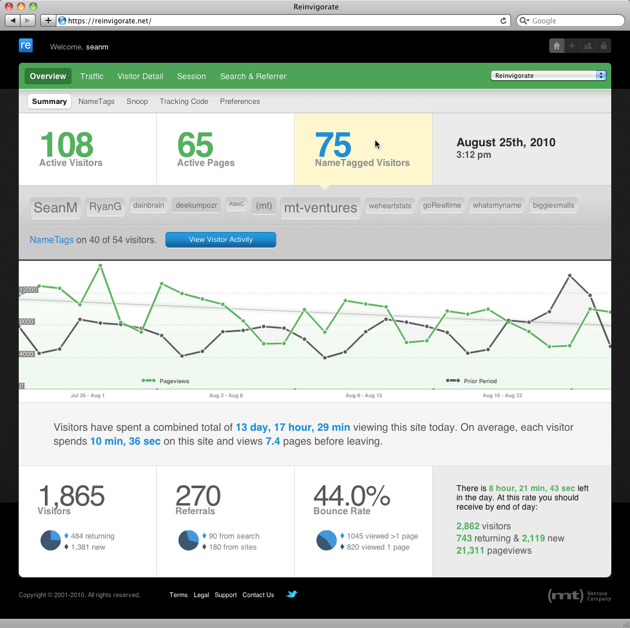 Given how quickly things spread across the web these days, the future is clearly real-time, and today sees the public launch of another powerful analytics service called Reinvigorate.net. After logging into the site you’ll see an overview page which displays the number of currently active visitors, active pages, and a graph of your traffic over the last few hours, all of which update in real-time. If you’d like to drill down more, you can jump into a separate Traffic tab, which includes stats like your daily and monthly visitor counts, bounce rates, and a breakdown of how much traffic each page is drawing. At this point the site doesn’t offer much in the way of a real-time visualization of your traffic the way Chartbeat does, but the company says that it’s coming in the future. Reinvigorate.net also offers heat-maps, which allow you to see where users are clicking across each of your pages. These have been available through other services, like Crazy Egg, but the Reinvigorate team believes it’s the only service to offer both heat maps and live analytics in one package. The main overview page also offers “Live Visitor Tracking” — a list of the users currently browsing your site, listed by their username. This is where Reinvigorate.net gets a bit creepy. 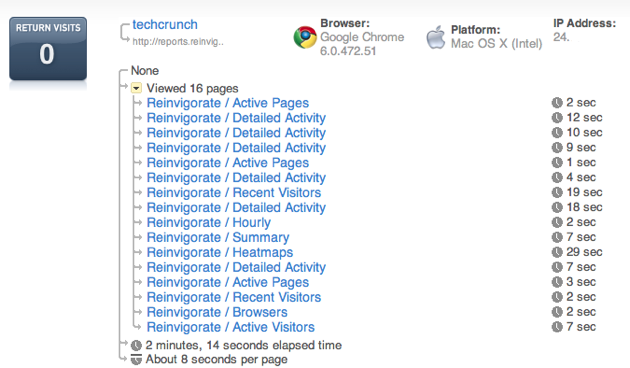 If you’ve integrated Reinvigorate’s analytics tools, you can track the browsing habits of each of your visitors across your site, labeling each user with the name they used to register or to leave comments with. You can use the real-time overview to see who is currently browsing your site, or you can jump to the ‘Detailed Activity tab’ to look back at any user’s browsing history, including they’ve time spent on each page. This information can of course be very helpful for site owners, and it’s been technically possible to do this kind of tracking for quite a while. But most systems don’t make it this easy, and it’s a bit unnerving. The service has an unusual backstory. It was created as a side project back in 2002 by Sean Mcnamara, who was a longtime MediaTemple partner. In 2008, MediaTemple acquired it through its ventures arm mt ventures, and Mcnamara began working on it full-time. The service has only been available with an invite until now, but has still grown to tracking 15,000 sites and 500 million pageviews over the last 30 days. Reinvigorate.net runs $10 per month for its beginner package and ramps up to a $20/month Pro account, with custom plans available for “ultra-high traffic sites”. If you’d like to try it out there’s a free 14 day trial. Also see Clicktale, which is significantly more expensive (the “small site” plan starts at $99/month).